(left) Jay Chou, and (right) Nicholas Tse face off in The Viral Factor. The Skinny: Explosive action, explosive drama and explosive overacting carry The Viral Factor, but the ludicrous storytelling may steal the show. Dante Lam's serious action-drama is kneecapped by its ridiculous story, which features so much coincidence and contrivance that it's poor even by Hollywood's already low standards. Action fans may not care, but those expecting solid all-around filmmaking beware. by Kozo: Dante Lam’s The Viral Factor has the action goods. Just don’t expect it to make sense, because it won’t. Lam regular Nicholas Tse stars with Jay “Kato” Chou in this would-be blockbuster with impressive Hollywood-level pyrotechnics and ludicrous Hollywood-level screenwriting. Chou plays Jon Man, a member of the totally made up International Defense Commission (IDC), whose lover and IDC teammate Ice (Bai Bing) is killed by turncoat IDC officer Sean Wong (Andy On). The IDC is supposed to protect a doctor holding the secret to a deadly strain of smallpox, but Sean kidnaps the doctor and offs his own team. His goal: cause an outbreak and market the cure, netting himself mucho bucks in the process. Jon can’t do much about it; he ends up with a bullet in the brain and two weeks to live. Left with a forehead entry scar and some nasty migraines, he decides to spend his last days at home with his crippled mother (Elaine Kam). Nearing her twilight, Mom asks Jon to go to Malaysia to find his wayward father Man Tin (Liu Kai-Chi) and also big brother Man Yeung (Nicholas Tse), who Jon didn’t even know existed. There are hidden family pains that may make her request difficult, but Jon’s going to die anyway - why not spend his last days zipping to Malaysia for an awkward family reunion? Unfortunately, Yeung is a certified criminal; he’s introduced while on trial in a courtroom, whereupon he’s convicted, escapes from captivity and starts his next assignment: to kidnap Rachel (Lin Peng), a doctor who can put together Sean Wong’s new smallpox virus (the previous doctor died). Yep, Jon’s brother is working for Sean, the guy who killed his lover and left a bullet in his brain – oh, and Jon is friends with Rachel, having met her on the plane to Malaysia when she helped him with his headaches. Thanks to that slick coincidence, Jon meets and fights Yeung even before finding out that Yeung is his brother. It’s only after contacting his father and meeting Yeung’s daughter Champ (Crystal Lee) that Jon realizes he fought his brother. Then, while sitting in a café, Jon hears gunshots and hey, there’s Yeung again! Chases and fights ensue, and Jon must choose between helping Yeung or bringing him to justice. And all this time, Jon has no idea that Yeung is working for Sean, nor does he realize Sean is after Rachel to complete the formula for the same virus that left him with a dead girlfriend, a bullet in the brain, etc. After Jon randomly glimpses Sean driving down the street in Malaysia, he pieces it all together. Actually, Jon doesn’t; he just follows Sean and runs into Yeung again, leading to more fights and chases. If Jon’s mother turned out to be Sean’s ex-lover it might be only slightly less believable than Viral Factor’s actual plot. And by the way, Sean is Rachel's former lover, plus he’s Champ’s foster father and Man Tin’s golfing buddy. Well, not really - but why not? Wouldn’t all that make for a gripping drama about brothers, friends, fathers, mothers and doctors whom you meet on airplanes? Viral Factor has a story that’s so dependent on coincidence that it could be used as a cautionary lesson for aspiring screenwriters. Dante Lam collaborated with writing partner Jack Ng and producer Candy Leung on the screenplay, which marries high-octane action with Lam’s trademark hard-boiled characters and the sort of serendipity one might find in a children’s fable. Besides the insanely connected characters, the story moves forward with almost casual convenience. Characters bump into each other when they need to, infiltrate police stations by nonchalantly jumping fences, and show up in helicopters right when someone else needs a lift. The enmity between Jon and Sean is completely botched; given that Sean basically ruined Jon’s life, the film should build from minute one to a confrontation between the two. But it doesn’t do that. Instead, Sean just happens to be in the same place that Jon is, and just happens to be involved with Jon’s brother – all during Jon’s last days alive. Add these screenwriter shortcuts to the film’s unswervingly serious tone and you have a movie that’s just plain ludicrous. But there’s action. Lots and lots of action. Action junkies who excuse bad storytelling in exchange for bloodletting may still be happy with Viral Factor, as it provides the sort of loud and chaotic mayhem that likely drew them to Asian Cinema in the first place. No stranger to impactful action, Lam and co-action director Chin Kar-Lok use their upped budget to stage chaotic chases, metal-crunching car crashes, and the type of stuntwork little seen since the heyday of Jackie Chan. Lam goes for mostly practical effects and hides his CGI smartly – there’s danger and tension in many of the action sequences, and even when things get unbelievable (e.g., the numerous times someone gets up from a likely fatal fall), it’s piled on with such senses-shattering, eardrum-bursting force that audiences may simply be cowed into submission. The action isn't really memorable and the sheer amount of mayhem renders some of it superfluous. 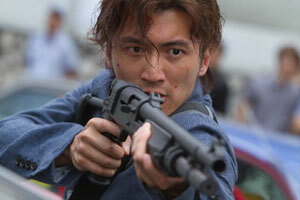 But give Lam credit: he knows how to deliver cinema action with transfixing force and verve. Also impactful are the film’s emotions, which are deadly serious and portrayed with snot-dripping histrionic excess by Lam’s ace cast. Nicholas Tse and Liu Kai-Chi should always play father and son, as they share the same propensity for physical overacting. Both get heavy emotional scenes or ardent monologues to convey their pain, and as overblown as they are, they do affect. Elaine Kam also gets long monologues, while Jay Chou gets super-forthcoming voiceover. Chou’s performance is a bit cold, but that’s fine as his underplaying nicely balances the overacting from his co-stars, from Tse to Liu to Keung Ho-Man (as a corrupt IDC officer) to Carl Ng (as Jon’s needlessly intense colleague). Female characters are overshadowed, with Bai Bing only getting early burn while Lin Peng exists mainly as a plot device or damsel in distress. As the baddie, Andy On has sharp physical presence, but his English delivery is distractingly poor. Still, On should get credit for memorizing the endless exposition that passes for his dialogue.